Nevada’s wine and viticulture advocacy group will redefine itself in 2018, following a weekend retreat where new board members were initiated. Nevada Vines and Wines will reach south to work with growers and winemakers in Clark County and the state’s rural regions. The organization also expects to collaborate with Nevada’s growing contingent of craft brewers and distillers to influence alcohol regulations. 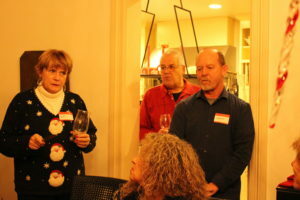 Bath will invite southern industry members to join the organization and to attend events in Reno. At its retreat, the board welcomed Adrian Dyette and Stuart Michell as new members. Steve Bamberger and Mary Sauvola have both resigned from the board for personal reasons. It’s currently unclear whether Bamberger will continue to coordinate the group’s annual winemaker awards held in the spring. Vines & Wines will also seek a new location for its monthly third Thursday tastings. The February tasting will feature chocolate and wine pairings with Allison Robinson of Wine Tahoe will pour from Boisset Collection. This event is scheduled for 5:30 p.m. on February 15 at the 4th Street Wineries. THIS STORY HAS BEEN CORRECTED: An earlier version of this story identified new Vines & Wines board member Stuart Michell as Stuart Mitchell.